Whereas Car Mechanics magazine waded into the murky world of home DIY repair, and motoring on a shoestring, the publication featured here concentrated on the oft murky world of the post-war motor trader. Britain in the years following WW2 was still trying to dig itself out of the mire, with much of its car production going for export, in a bid to raise the nation's coffers. Despite being quiet, there was still a new- and secondhand car market in the UK, although anyone placing an order would have to expect a lengthy wait before a new motor-car would arrive on the driveway. Motor Trader, or The Motor Trader as pre-1950 issues were called, was a publication aimed at businesses both large and small. New-car dealers, secondhand car salesmen, and back street garage owners would all find something of interest in these small format weekly publications, in as much the same way as the trade today find useful information on the Motor Trader website (what would 50s bombsite car dealer make of the internet I wonder?). 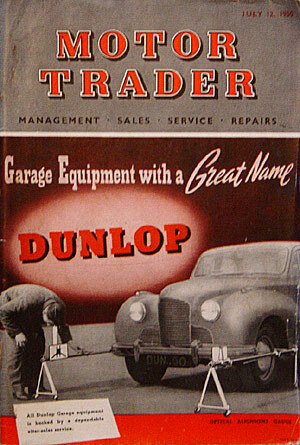 The cover of the July 12th 1950 issue shows a car having its tracking adjusted, courtesy of a Dunlop optical alignment gauge. The car in question I think was an Austin A70 Hampshire, although the photo has been touched-in to distance it a little from the original car's styling - note the extra grilles either side of the factory fitment, and re-worked bonnet badge. Inside is a wonderful selection of advertisements, all aimed at the motor trade, one of the reasons I bought a small pile of these mags some years ago at an autojumble. Titles aimed at the owner-motorist are quite easy to find, but trade journals a little less so. Adverts suited to the oily-fingernailed garage proprietor include that by E.G. Brown & Co. Ltd. of Tottenham in London. They could provide 'everything in sheet metal work', for 'aircraft, automobile, coach and bus bodies'. On the same page is a plug for 'Elpico' Car Radio Aerials - with a note that '... Derationing of petrol boosts summer sales ...'. Other ads were for Andrex friction type suspension dampers, Harvey Frost hydraulic jacks, Legg battery chargers, Hoffman bearings, the Beemee Tyreflator, Holospar Refrigerated Vehicle Bodies, the new P.C.L. 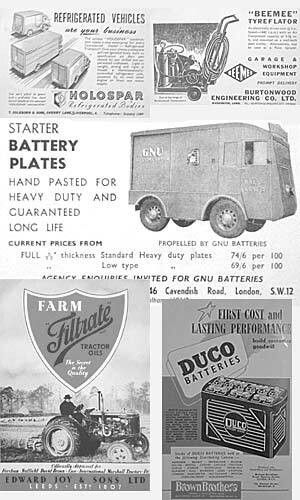 Pedestal Air Meter, Westalite Battery Chargers, and hand pasted starter battery plates from the Gnu Accumulator Company, again aimed at the mechanic rather than motor dealership, to name just a few. "Who holds the most motoring records? It looks as if this honour should go to Alan Hess, public relations officer, Austin Motor Co. Ltd., whose personal score is 149. This includes 95 American stock car records, 18 local Indianapolis and 36 USA national records. Many of these were set up in partnership with other drivers. Solo efforts by Mr. Hess total 51." A write-up on some of his record attempts, in this case driving an A90 Atlantic, can be found a little way down a page on this site, and his drive in an A40 Devon to record 10,000 miles in 10,000 minutes appears on the excellent Austin Works website. But, back to Motor Trader, and other people in the news back in 1950 include A.J. Billingham, who took on the role of a director at the Halford Cycle Co., and Commander J.H.F. Kent who was re-elected as President of the Retreat Manufacturer's Association. Sir William Rootes entered Angus cattle at the Royal Norfolk Show we are told, and in so doing won 3 championships, a reserve championship, and 2 first prizes! no bull there then! Among the other news items was a snippet regarding the new-for-1950 Nash station wagon, priced at $1808 (or ï¿½645 sterling), apparently the lowest-priced vehicle of its kind on the US market, at that time. Within the auction section, is news of a sale starting on July 17th at the MoS (Ministry of Supply) depot, Thorp Arch, Boston Spa in Yorkshire, and running to August 2nd. A whopping 3,170 motor vehicle were due to be sold during this period! In addition to light and heavy trucks (presumably de-commissioned military vehicles? ), vans, utilities, coaches, cranes and tippers, there was due to be 290 or so motorcycles, and over 200 saloon cars going under the hammer. Must have been quite a sale! Results from more traditional auction sales were also given in the pages of Motor Trader, to give traders an idea of trade-in values applicable to any old cars that may chug onto their dealer forecourts later in 1950. All the usual candidates appear in the listings, including examples of Austin 7, Hillman 10hp, Vauxhall 14 and various Singers, Standards, MGs and Wolseleys. Cars of note for me were a 1936 Chevrolet 27hp saloon (ï¿½105), 1938 Studebaker 27hp saloon (ï¿½173), a quality 1937 Humber 12 drophead coupe (ï¿½325), and a 1937 Fordson 5cwt van making just ï¿½96. Second cheapest of all the cars listed in recent results was a poor old Sunbeam 12hp saloon from 1935, which struggled its way up to just ï¿½52 during a sale at the Southampton Motor Auction Mart Ltd, Bassett Hotel, Burgess Road. Award for cheapest of all though falls to a 1935 Morris 16hp, which was taken away for a hammer price of ï¿½40 at the West of England Motor Auctions, at Shepton Mallet in Somerset. Exciting new car accessories also get a mention in Motor Trader. Owners of Ford 8/10 and Morris Minor cars could drop a letter to W. Archer, of Stowe Street in Lichfield, and buy one of their super chromium plated gearlever extensions, available in a number of lengths to fit to the top of the existing floor-mounted lever. If you planned to do some respraying, you could pop down to Prima Industries in Birmingham, and avail yourself of a Prima spraying outfit (No.777), which incorporated a spray gun connected to a hand-pumped pressure cylinder, which looks not unlike the early style of manual tyre inflators. Runnin, a colloidal graphited upper cylinder lubricant and running-in compound, could be purchased for ï¿½1 12s a gallon from the Edward's Manufacturing Co. who were situated in Birkenhead. A classifieds section rounded out the content of this week's magazine - anyone looking for parts to resurrect their old Packard could call into Joe Thompson's premises in Fulham Rd, London W3, whereas anyone dabbling with an ex-military Jeep could do worse than pop by Autowork Ltd, of Winchester, who were the ".. largest Jeep spare stockists, have practically everything for the Jeep, new and second-hand; also Jeeps and trailers". Perhaps they'd be attending the MoS auction sale up in Yorkshire, to buy up stocks of Jeep parts? Sadly with no price mentioned, but one I'd like to have had a look at, was a V8 Ford 30hp breakdown lorry, with a reconditioned engine just fitted, and a Harvey Frost crane on the back - possibly ex-military too? Just to show how the world of advertising has changed, have a read of this flowing advert for car seat covers: "Those attractive felt covers you have so much admired, are individually tailored by 'Karobes' for the discerning motorist; if you will kindly write or phone to L.M. Keegan ..... we shall be pleased to let you have full particulars." Nowadays such an advert would be altogether less pleasant and courteous I suspect. Buried deep within the Miscellaneous section is perhaps the most interesting vehicle of all - a 1901 Lifu steam car No.1. The advert reads ".. this is a most interesting vehicle in remarkably good condition, carriage body, tiller steering, licensed and insured; owner has insufficient accomodation; private owner; offers invited". Sadly there is no photograph, or information on who the owner was. I bet it took part in the London to Brighton run, but where is it now I wonder?? Other motor trade services or products offered in the back pages include the dubiously-titled 'Homo-Hygrade' die-pressed aluminium number plate, Avery Hardoll and Beckmeter petrol pumps, Dykes Automobile Encyclopaedia, motor sponges from Hydra Sponge in London, and the Trico vacuum-operated post horns - single, twin and 3-horn sets available. Return to the car magazines section. Elsewhere on oldclassiccar, is a section featuring garages that would have been operating back in 1950, and somehow survive to this day - visit the old garage & filling station pages to see them. Another trade magazine, called The Garage & Motor Agent, also from the 1950s, can be found here.